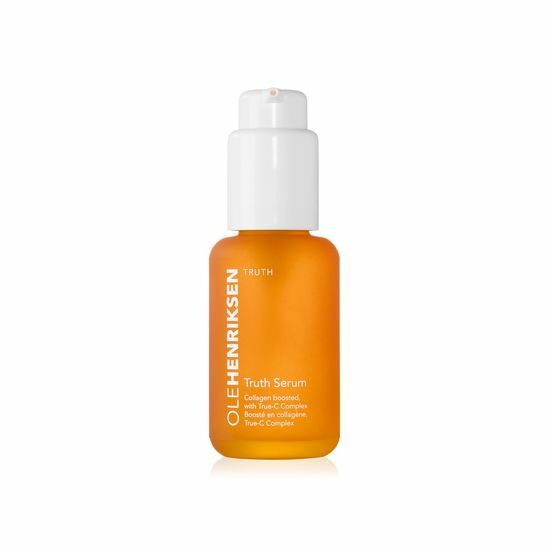 Ole Henriksen got the idea for Truth Serum after meeting two-time Nobel Prize winner Linus Pauling and learning about his research on the effects of Vitamin C on the immune system. Ole wanted to incorporate this “free radical scavenger” into his skincare philosophy. OLEHENRIKSEN was one of the first brands to use vitamin C.
Truth Serum brightens and firms visible signs of aging in skin and also delivers all-day hydration. It's like a daily multivitamin for the skin and it's OLEHENRIKSEN's #1 selling ade-defying serum. He was an early adopter of Vitamin C in skincare, beliveing that its anti-oxidant properties and role in promoting collafgen make it a crucial ingredient. Supercharged with the True-C Complex™ and collagen, this potent age-defying serum helps brighten and firm the skin as it delivers all-day hydration. Also enriched with orange and green tea extracts, this fast-absorbing, oil-free formula revives the complexion. You will love to indulge in this serum’s sweet, energizing citrus aroma and silky texture as it glides beautifully on the skin for a healthier, more youthful-looking Ole Glow™. To use: Apply Truth Serum evenly to face and neck daily, taking time to enjoy the uplifting citrus scent and silky texture. After fully absorbed, follow with the OLEHENRIKSEN moisturizer of your choice. For external use only. Use as directed. Avoid contact with eyes. In case of contact with eyes, rinse immediately. I adore this serum. It is truly my favorite Vitamin C serum of all the ones I have ever used. I tried a bottle of this about 6 years ago and just now. I did not review it but remembered how wonderful the serum made my skin feel. Almost spotless at the time. My skin looked amazing. And lately my skin looks amazing too! I did a without makeup pic shot a little while ago, I'll post it here again. This serum truly brightened my skin so much that it made my skin look almost flawless. Sheer Transformation Perfecting Moisturizer was originally developed as part of the 3 Little Wonders Set. It was created to be the ultimate moisturizer for all ages and all skin types. It hydrates, evens skin tone, smoothes skin texture and helps improve the look of dark spots and discoloration. It's practically perfect! Transform the way you think about your moisturizer, then transform your skin. 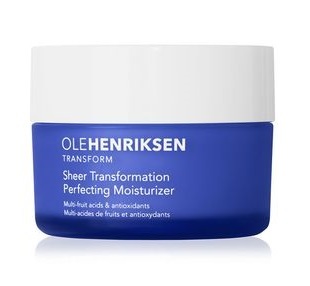 Sheer Transformation Perfecting Moisturizer delivers weightless hydration and luminous perfection. With its whipped, silky texture, this bestselling oil-free moisturizer imparts essential moisture to the skin, even as it delivers radiance and helps improves the appearance of dark spots and discoloration. It is formulated with multi-fruit acids, licorice and pea extracts to help gently refine uneven skin tone and texture. This silky, multitasking moisturizer is also the perfect prep step for makeup: it instantly smooths skin texture and brightens skin, for flawless foundation application. Ole created Sheer Transformation to be used with Truth Serum® and Invigorating Night Transformation™ Gel in the 3 Little Wonders® set, but it quickly became a favorite for its versatility—it’s for all ages, all skin types, it can be used day and night, and with any product, to leave the complexion soft and radiant with a healthy, nourished Ole Glow™. To Use: Apply evenly to face and neck AM and PM. Gently massage in an upward, circular motion. Layer over your preferred OLEHENRIKSEN serum. For external use only. Use as directed. This moisturizer is practically perfect. It hydrates skin, gets rid of dead skin cells, softens the skin, is so light and sinks right into the skin, it helps nourish the skin and leaves skin practically glowing. I really like this moisturizer. It is in my top five. 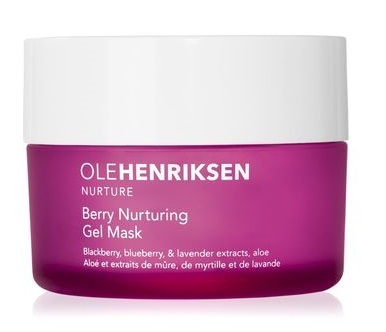 The Berry Nurturing Gel Mask was inspired by Ole Henriksen's love affair with berries. Ole wanted to give skin the same nourishment while quenching dehydrated skin. To elevate the experience further, he chose a cooling gel formula and calming lavender scent for an all-encompassing escape to tranquility. It's similar to having one of his spa experinces. Berry Nurturing Gel Mask nourishes, soothes and hydrates the skin, all with a gentle blend of blackberry and blueberry extracts, ProVitamin B5 and aloe vera juice. Inspired by the most pampering spa experience, a subtle lavender scent helps calm and renew the senses. Instantly skin is soft and quenched in moisture, with a supple, healthy-looking Ole Glow™! To Use: Apply a thick layer to clean, dry skin on face and neck. Leave on for 20 minutes. Rinse off with water or remove with a damp wash cloth. Follow with the OLEHENRIKSEN moisturizer of your choice. Use 2-3 times per week. For external use only. Use as directed. Avoid contact with eyes. In case of contact with eyes, rinse immediately. This mask really hydrates, calms and soothes the skin. It also nourishes it with all of the nourishing ingredients such as berry extracts and aloe very juice. The ProVitamin B5 really helps to soothe the skin. I would recommend this mask for just about any skin type really, it is not restricted to any one skin type as it has the ability to help every skin type. OLEHENRIKSEN Truth Serum comes in three sizes: 1 fl.oz ($48.00). 1.7 fl.oz. ($72.00) and 3.4 fl.oz. ($128.00). I tried the 1.7 fl.oz. size. Ole Henriksen is available online at www.olehenriksen.com, www.sephora.com and SEPHORA stores. Like Ole Henriksen on Facebook: https://www.facebook.com/olehenriksen/; Follow Ole Henriksen on Twitter:@OleHenriksen; Follow Ole Henriksen on Pinterest: https://www.pinterest.com/olehenriksen/; Follow Ole Henriksen on Instagram: https://www.instagram.com/ole_henriksen/ and Subscribe to Ole Henriksen on YouTube: https://www.youtube.com/channel/UCekD0vi0biqmC2HegotdN1g?sub_confirmation=1.